It is a “disgrace” that children are the “forgotten victims of domestic violence”, says leading charity Refuge, as new figures reveal that one-third of mothers are injured by the time they seek help, with much of the violence witnessed by their children. Rachel (not her real name) was eight years old when she lay across her mother’s body to prevent her father from attacking her. Thwarted in his efforts, he smashed up the coffee table and threw her five-year-old brother across the room. At the age of 10, Rachel managed to get her mother to safety after her father had threatened to kill her yet again. The family spent three days with a friend before getting a place with Refuge, where they were able to stay for six months. Rachel believes her mother “would have been dead” without this support. Her story underlines how the current crisis in refuge provision for women – with one in four specialist services closing down between 2010 and 2014 – is having an impact on children. About 32 per cent of mothers are injured when they first seek help with Refuge, according to new research released by the domestic violence charity to The Independent on Sunday. Nearly three-quarters were very frightened of further violence, while half had received threats to kill them or their children. Almost 40 per cent have had weapons used against them, while 49 per cent had been strangled. Shockingly, the majority of this abuse is witnessed by children, while two in three children exposed to domestic violence were also harmed, according to a recent report from SaveLives charity. The report says that 130,000 children in the UK are living in homes where there is a high risk of murder or serious injury, and a quarter of children living with high risk abuse are under the age of three. Despite this, children’s services, such as play specialists and counselling – essential to help children process what they have witnessed in the home – have been among the first things to go under local government cuts to domestic violence services. 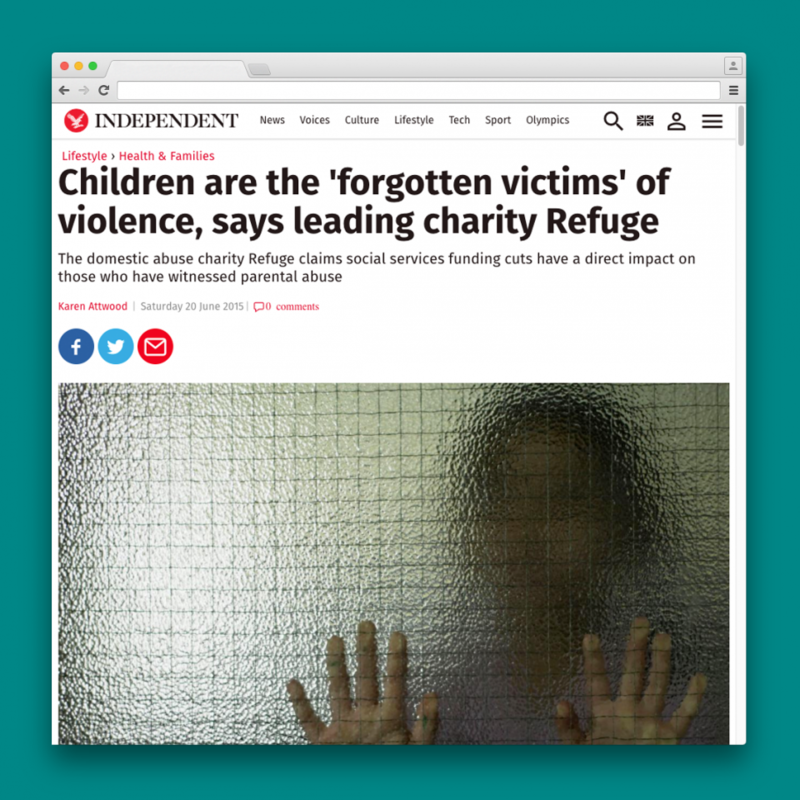 Sandra Horley CBE, chief executive of Refuge, says it is a “disgrace” that children whose lives are blighted in such a fundamental way are so often the “hidden or forgotten victims of domestic violence”. There are an estimated 39,000 babies living with domestic violence in the UK, and “others who die before they are born during assault to their mother”, she adds. After enduring multiple miscarriages brought on by her violent partner, strangulation, kicking and punching, and following numerous police callouts, Diana (not her real name) finally got a place in a refuge when her second child was just 10 weeks old. Her elder son, who is autistic, witnessed a lot of the abuse when he was four years old and says that when he closes his eyes he can still “see what happened”.